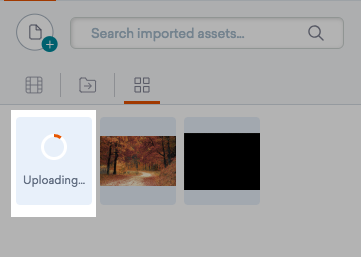 1) Select the Import icon in the Asset Library. 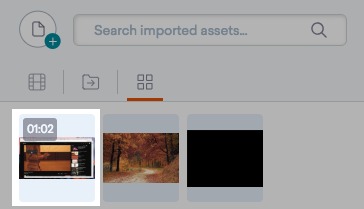 2) Select the + icon and browse for an MP4 file. 3) An upload image shows progress until the video is successfully added to the Vyond Studio. 4) A thumbnail of the video appears after a successful upload - drag the MP4 into the stage to add it into the project. Drag the border of the uploaded video to change the size to fit the stage. The video file type for upload must be MP4 with h.264 codec - the upload will fail with any other video file type, extension, or codec. Only one video per scene is supported. The size limit for an uploaded video is 100MB and time limit is 90 minutes. Uploaded videos added to the stage will only show up to 4 minutes in the existing scene. 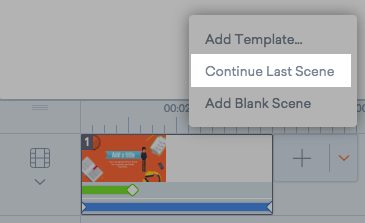 Add another scene if the MP4 is longer than 4 minutes by clicking the Continue Last Scene option in the timeline.